Are You a Gouty Ostrich? 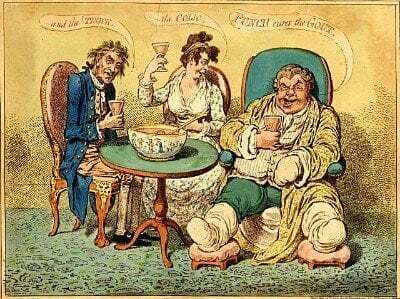 I hate saying there is a typical gout sufferer. Every gout sufferer is different. Different symptoms. Different history. Different treatment needs. That is why I’m devoting 2015 to make my gout support services personal. But within the group of individuals, there are always a few distinct types. The most common is probably like me – indulgent, inactive, overweight, and middle-aged. Before you get to my gout type, you are a pre-middle-aged Gouty Doubter, who thinks that eating the occasional fruit or vegetable in their week of 30 meat dishes will remove any chance of gout. 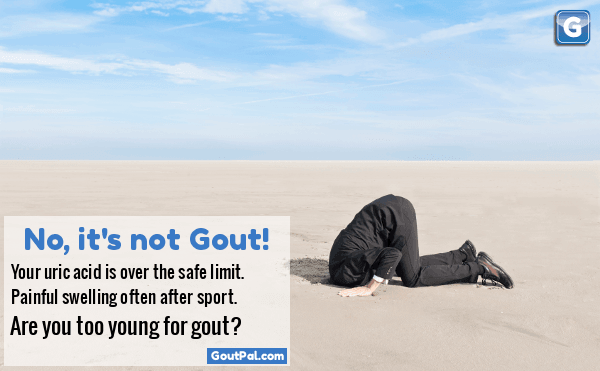 That unwillingness to accept gout as a warning to take serious action seems strongest in the sporty 30-40 year-olds. Every twinge is put down to over-exercise. Every swelling is a sports injury. “The doctor says my uric acid isn’t really high, so I can’t believe I have gout.” This is your Gouty Ostrich! It’s easy to get confused, so I understand why heads hide in the sand. There’s an awful lot of bad gout diet advice about. We naturally pick certain factors, rather than tackle the real problem, which is lack of foundation. A healthy, balanced diet is simply one that is based on real food, not the packaged, processed, food-like substances full of gout-giving additives. We should eat just enough to supply our energy and nutrition needs, and it should be mainly plant based. But rather than spend time creating that healthy eating plan, our Gouty Ostrich picks on one item, such as beer. Thinking that stopping beer will stop your gout is like thinking more beer will make you a better lover. But confusing diet advice is nothing compared to confusing medical advice. Seriously good gout professionals tell us that 5mg/dL is the safe upper limit for uric acid for most people. Many doctors looks at averages, then say: “Your 7.9 is not much higher than many people.” That’s insane! We aim for 5 because it gives a safety margin. If we have other serious illnesses that limit treatment, we might have to settle for 6. If we keep warm, it’s unlikely that uric acid crystals will form until around 6.5. Over 7, unless you have some very rare conditions, uric acid crystals will form every day. New daily crystals do not always trigger an acute gout flare. Our immune system is good at fighting uric acid crystals. On most days, uric acid crystals will be silently engulfed by white blood cells, and you get dull aches, a slight twinge, or do not even notice. An active sportsman or sportswoman will not give this much regard. You get used to a few bangs and bruises, so minor pain is just part of the game. Why worry, if it’s not a full blown gout attack? I’ll tell you why you should worry. Those white blood cells that sacrifice themselves to fight uric acid crystals are not always the ones destined to become immune system soldiers. Other cells are destined to repair and renew bones, cartilage, and tendons. These cells are also sacrificed in the fight, resulting in all sorts of joint damage. For a quick overview, see some of the articles related to uric acid crystals and tendons. Hey, Mr Sporty Gout Sufferer, you’re supposed to look after your tendons, not let them get weakened by gout! Now, I’m sorry for having a rant. I hid my head in the sand for many years. At one point, I became a joke in the gout forum. Ready to push the joys of allopurinol, but not prepared to take the plunge. I do understand how hard it is to accept lifelong daily health intervention. All I ask is that you understand that by denying yourself treatment, you are accepting lifelong daily joint damage. You’re a young, fit, sporty person, so it will take many years to be crippled. Do you really want to give your older self that pain? If you’d like to give your older self a better chance of enjoying life, I am here to help. All you need to do is ask. We all have individual worries, but none of them are unbeatable. The only thing that will stop you beating gout is ignoring your problems. It does not matter if your gout worries seem too trivial to mention, or so big that you have to hide your head in the sand. Stop ignoring the issues, and get personal gout help now.